NOTE: Please click here for Sports Medicine Clinic appointments and information. PHONE: Call SHCC’s Green Team at (352) 294-7471. The first and only center of its kind at the University of Florida, the UF Sports Concussion Center supports the clinical care, testing and research of concussive injury in all UF students — athletes and non-athletes alike. A division of the Student Health Care Center, the center receives staffing support from the University Athletic Association. 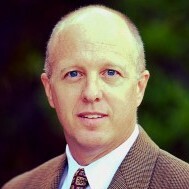 Dr. Clugston is an Associate Professor in the Department of Community Health and Family Medicine. He is Board-certified in Family Medicine and holds a Certificate of Added Qualifications in Sports Medicine (CAQSM). He serves as a team physician for the University of Florida Athletic Association with primary responsibility for football, men’s basketball and men’s golf. 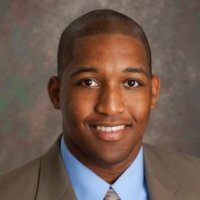 He founded the UF Sports Medicine Fellowship in 2006 and currently serves as the program’s assistant director. His research interests are focused on concussion management, and he is principal investigator for several ongoing concussion research studies. He also currently serves on the NCAA/DOD Grand Alliance Consortium Operating Committee, the Southeastern Athletic Conference (SEC) Working Group on Concussion and the Arena Football League Concussion Task Force. 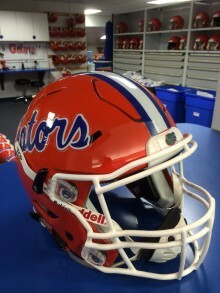 The UF Sports Concussion Center is a participating organization of the NCAA-DOD Grand Alliance CARE Consortium. New York University, School of Medicine, Department of Neurology, Concussion Across the Spectrum of Injury Conference (Feb. 26, 2016): Center Director Dr. Jay Clugston served as an invited guest faculty at the conference, held at the Skirball Performing Arts Center on the NYU campus in New York, NY, presenting a lecture entitled “Concussion Prevention in Football” to 400-plus attendees. 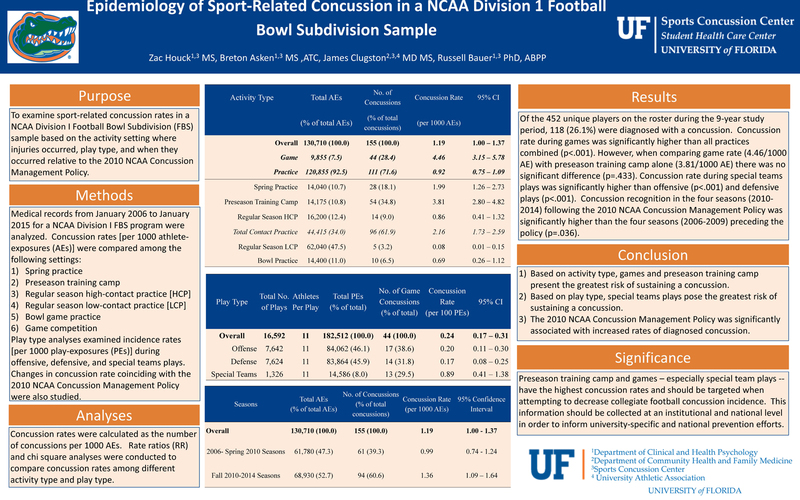 Florida Gators (March 31, 2015): Heady ambitions: The University of Florida is involved in a landmark concussion study in alliance with the NCAA and U.S. Department of Defense. 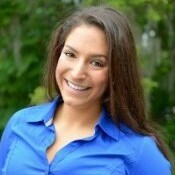 Breton is a graduate student in the Neuropsychology area of UF’s Clinical and Health Psychology doctoral program. His clinical and research interests include pre-morbid characteristics affecting cognitive function in the context of sport-related concussion, as well as investigating the utility of cognitive rehabilitation in athletic populations. Breton previously attended the University of North Carolina at Chapel Hill where he earned degrees in Psychology and Exercise and Sport Science – Athletic Training. He has been a certified athletic trainer since 2013. While at the University of North Carolina, Breton was a research assistant at the Matthew Gfeller Sport-Related Traumatic Brain Injury Research Center. Jon Boone is in his first year at the University of Florida as part of the University Athletic Association’s Sports Health staff. Boone also serves as the Research Coordinator for the NCAA-DoD Grand Alliance Longitudinal Clinical Study Core. Boone spent the previous three years at the University of Delaware as the Associate Head Athletic Trainer working with the football and men’s basketball programs, earning his Bachelor of Science in Athletic Training in 2008 from Delaware, and a Post-Professional Master of Science in Athletic Training from the University of Kentucky in 2011 while working with the Wildcats football team. 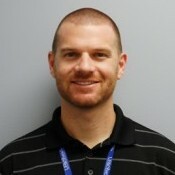 He is currently pursuing a Doctor of Physical Therapy at the University of St. Augustine. He also provides services as a national certified phlebotomy technician (NCPT). 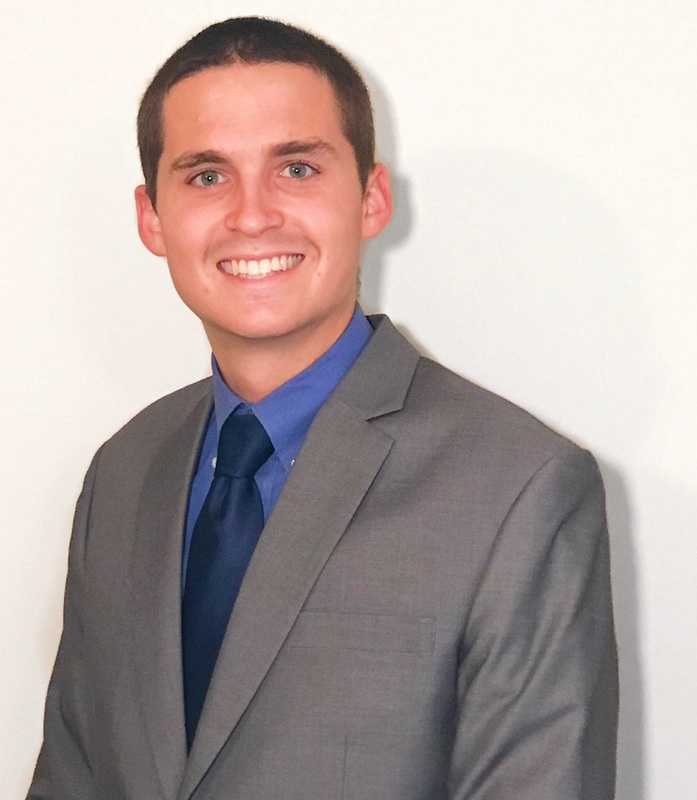 Zac is a graduate student in the Neuropsychology area of UF’s Clinical and Health Psychology doctoral program. His clinical and research interests include identification of non-injury factors that influence cognitive functioning, as well as investigating the utility of cognitive rehabilitation in both athletic and civilian populations. Zac previously attended Jacksonville University where he played collegiate baseball and earned degrees in Psychology, Sociology and Social Sciences. After graduation, Zac worked as a research assistant in a cognitive neuroscience lab at UF on a Department of Defense-funded study dissociating mild traumatic brain injury and post-traumatic stress disorder in a veteran population. Taylor is a graduate assistant athletic trainer at The University of Florida and a student in the Applied Physiology and Kinesiology department pursing his master’s in athletic training. His clinical and research interests include sport-related concussion, specifically diagnosis, prevention, rehabilitation, and the use of technology with mTBI. Taylor previously attended Charleston Southern University where he earned a degree in Athletic Training. He has been a certified athletic trainer since 2016. Taylor serves as a research assistant for the NCAA-Dod Grand Alliance Longitudinal Clinical Study Core. Zechariah is a student manager with the University of Florida football team, studying as an undergraduate in Applied Physiology and Kinesiology at the university’s College of Health and Human Performance. Zech currently works as the Head Impact Telemetry (HIT) System Assistant, and his research interests primarily focus on sports-related concussions and concussion management. Dr. Bauer, a Professor of Clinical & Health Psychology and Neurology in UF’s College of Public Health and Health Professions and Director of Clinical Training for the Clinical Health Psychology doctoral program, is Board-certified in Clinical Neuropsychology with 30 years of experience in neurobehavioral research, doctoral training and clinical service. He has over 90 peer-reviewed publications on traumatic brain injury and other brain disorders and neurobehavioral syndromes. His current research involves evaluation of concussion management protocols, and examination of structure-function relationships involving memory dysfunction, sleep disturbance and neuropsychiatric symptoms after mild traumatic brain injury including sports-related concussion and both civilian and military TBI. He has also lead the interdisciplinary Traumatic Brain Injury Research Group at UF, a group focused on developing translational research protocols. 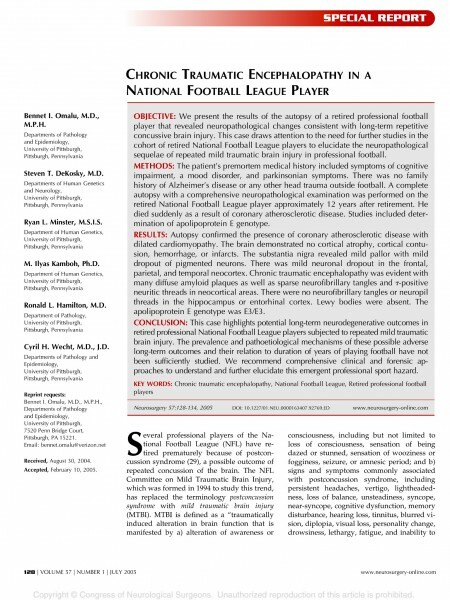 Dr. Steven DeKosky helped author the first scientific paper describing Chronic Traumatic Encephalopathy (CTE) in a professional football player. 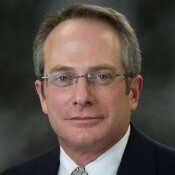 Dr. Steven DeKosky is the Aerts-Cosper Professor of Alzheimer’s Research at the University of Florida College of Medicine, and is the Interim Executive Director of the McKnight Brain Institute. He also serves as Associate Director of the National Institute of Aging- funded Florida Alzheimer’s Disease Research Center at UF. His academic appointment is as Professor of Neurology in the UF College of Medicine. His basic research centers on structural and neurochemical changes in human brain in aging and dementia and effects of traumatic brain injury. His clinical and translational research have centered on understanding the genetics, neuropsychiatric symptoms, neuroimaging, and treatment and prevention of AD. Beginning trauma studies as a Principal Investigator in the University of Pittsburgh Brain Trauma Research Center in 1992, he studied similarities in the injury cascades of TBI and AD. He was an author of the first reports of Chronic Traumatic Encephalopathy (CTE) in American professional football players. He was also a Principal Investigator in the clinical application of the breakthrough amyloid-imaging agent Pittsburgh Compound B (PiB). He directed an 8 year NIH-funded national multicenter trial to assess whether Ginkgo biloba can prevent or delay onset of dementia in normal elderly adults, the first large study of prevention of dementia/AD. Click here to read Dr. DeKosky’s full bio on the Department of Neurology website. 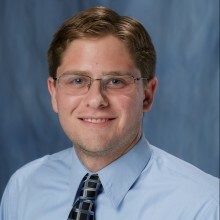 Dr. Eisenschenk is an Associate Professor of Neurology for the University of Florida’s Department of Neurology. He attended the University of Florida as a graduate of the Junior Honors Medical Program. He then completed his Residency, Fellowship, in Clinical Neurophysiology in Epilepsy and Sleep Medicine. 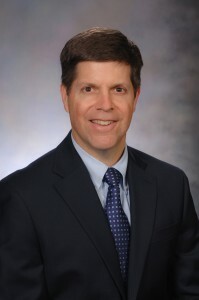 He is one of only a few physicians nationally board-certified in Clinical Neurophysiology and Sleep Medicine providing complete assessment of both his patients and the sleep studies he interprets with over 20 years of clinical and research experience. 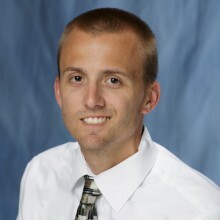 He has helped develop the Sports Neurology and Performance program at the University of Florida. Within the University of Florida Sleep Disorders Center, Dr. Eisenschenk provides evaluation of all sleep-related disorders including sleep apnea, parasomnias, narcolepsy, idiopathic hypersomnia, and nocturnal seizures. 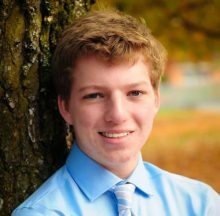 His clinical interests are traumatic brain injury (concussion), epilepsy, and sleep disorders focusing on improvement of cognitive and physical performance. His research focuses on areas of Sports Neurology, sleep medicine, epilepsy and driving capacity. His research utilizes neurophysiology and neuroimaging to establish diagnostic modalities improving cognitive and physical performance. 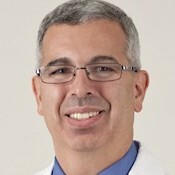 Michael S. Jaffee, MD, is an associate professor in the department of neurology at the University of Florida, where he joined the faculty in 2016. Prior to his current position, he was an associate professor of Neurology and Psychiatry at the University of Virginia, where he served as the inaugural clinical director of the Brain Injury and Sports Concussion Institute and director of the neurology sleep service. He graduated from the University of Virginia School of Medicine in 1992 and completed a combined residency in neurology and psychiatry at the San Antonio Uniformed Services Health Education Consortium in San Antonio in 1998. He later went on to complete a sleep medicine fellowship there in 2011. Dr. Jaffee is board certified in neurology, psychiatry, sleep medicine and brain injury medicine. He has additional certifications in behavioral neurology and neuropsychiatry, as well as neural repair and rehabilitation. His 21-year Air Force career included wartime service as the chief of the medical staff for the largest U.S. military hospital in Iraq and service as the U.S. Air Force Surgeon General neurology consultant. 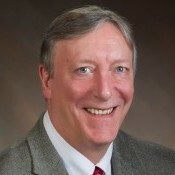 He served as the U.S. Department of Defense liaison to two White House-appointed panels of the Defense Health Board, and as the national director of the Defense and Veterans Brain Injury Center, where he managed a network of 18 sites leading to the publication of over 100 peer-reviewed articles and paved the way for research in the deployed combat area. Dr. Jaffee helped develop seminal clinical practice guidelines and tools for the management of traumatic brain injury. He has represented the Department of Defense with congressional testimony. 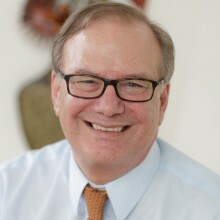 He has served as a consultant to the Institute of Medicine, the North Atlantic Treaty Organization, the National Institutes of Health and the Department of Labor. Dr. Jaffee retired from the Air Force in 2013 at the rank of colonel. Now at UF, he continues to serve as a national and federal subject matter expert and serves as chair of the Peer Reviewed Alzheimer’s Research Program as part of the Congressionally Directed Medical Research Program. He also is the senior neurologist serving on the American Board of Physical Medicine and Rehabilitation national Brain Injury Medicine board examination committee. Dr. Jaffee has dedicated a significant part of his career to developing innovative educational and research collaborations between the Department of Defense, federal agencies, academic institutions and other stakeholders, including the National Football League and the Alzheimer’s Association. Zach is a physical therapist for UF Health Rehab Centers specializing in the treatment of patients with vestibular disorders, including post-concussion syndrome. He completed his Doctor of Physical Therapy at the University of Florida in 2008 and currently serves as a Courtesy Clinical Instructor in the UF Department of Physical Therapy, where he provides lectures on vestibular and concussion rehabilitation. 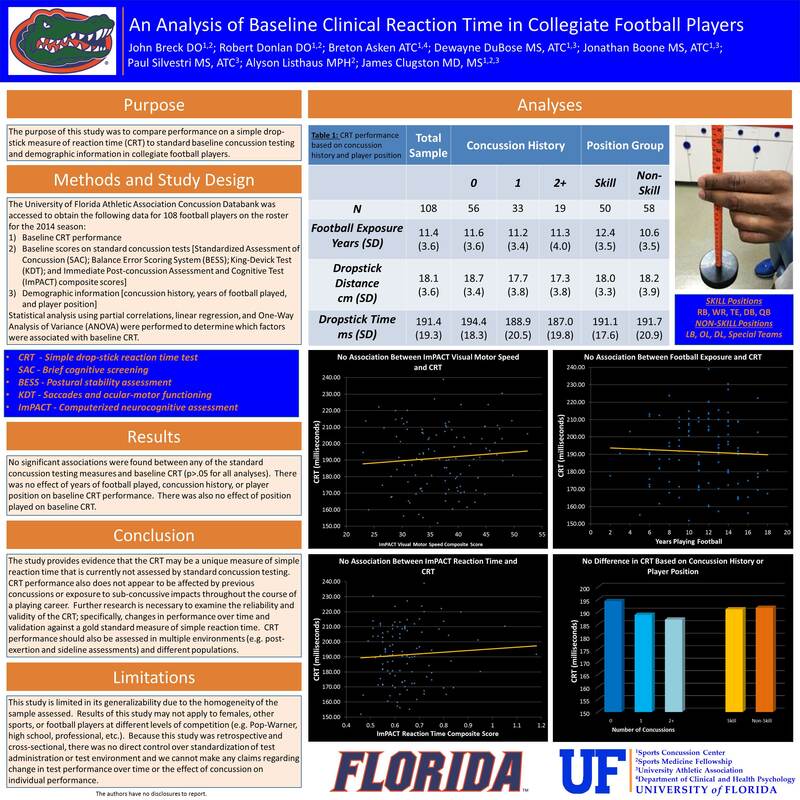 He has also presented at local and national conferences on concussion rehabilitation and acts as consultant to the University of Florida Athletic Association for treatment of athletes with vestibular and concussion related disorders. 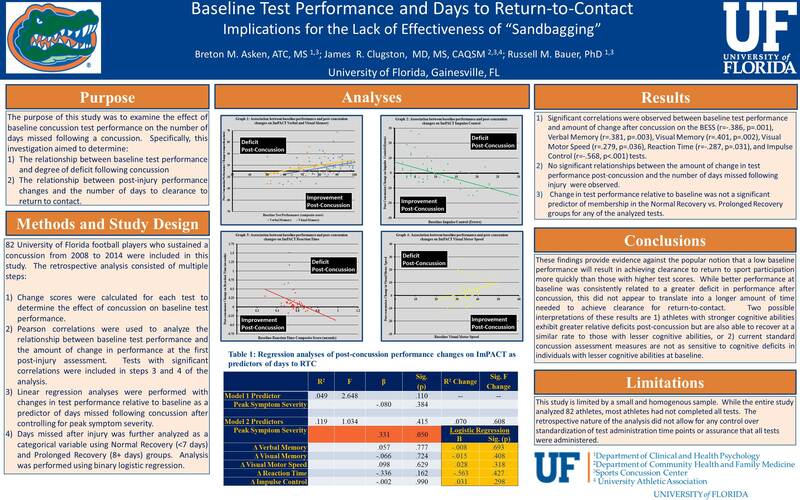 Baseline Neurocognitive Performance and Clearance for Athletes to Return to Contact. Asken, B.M. ; Clugston, J.R.; Snyder, A.R. ; Bauer, R.M. Journal of Athletic Training 2016; 51(12):000–000. DOI: 10.4085/1062-6050-51.12.27. Statements of Agreement From the Targeted Evaluation and Active Management (TEAM) Approaches to Treating Concussion Meeting Held in Pittsburgh, October 15-16, 2015. Collins, M.W. ; Kontos, A.P. ; Okonkwo, D.O. ; Almquist, J.; Bailes, J.; Barisa M.; Bazarian J.; Bloom O.J. ; Brody D.; Cantu R.; Cardenas J.; Clugston J.; Cohen R.; Echemendia R.; Elbin R.J.; Ellenbogen, R.; Fonseca, J.; Gioia, G.; Guskiewicz, K.; Heyer, R.; Hotz, G.; Iverson, G.L. ; Jordan, B.; Manley, G.; Maroon, J.; McAllister, T.; McCrea, M.; Mucha, A.; Pieroth, E.; Podell, K.; Pombo, M.; Shetty, T.; Sills, A.; Solomon, G.; Thomas, D.G. ; Valovich McLeod, T.C. ; Yates, T.; Zafonte, R. Neurosurgery. 2016 Oct. 12. PubMed PMID: 27741219. Factors Influencing Clinical Correlates of Chronic Traumatic Encephalopathy (CTE): a Review. Asken, B.M. ; Sullan, M.J.; Snyder, A.R. ; Houck, Z.M. ; Bryant, V.E. ; Hizel, L.P.; McLaren, M.E. ; Dede, D.E. ; Jaffee, M.S. ; DeKosky, S.T. ; and Bauer, R.M. Neuropsychology Review (2016). DOI: 10.1007/s11065-016-9327-z. 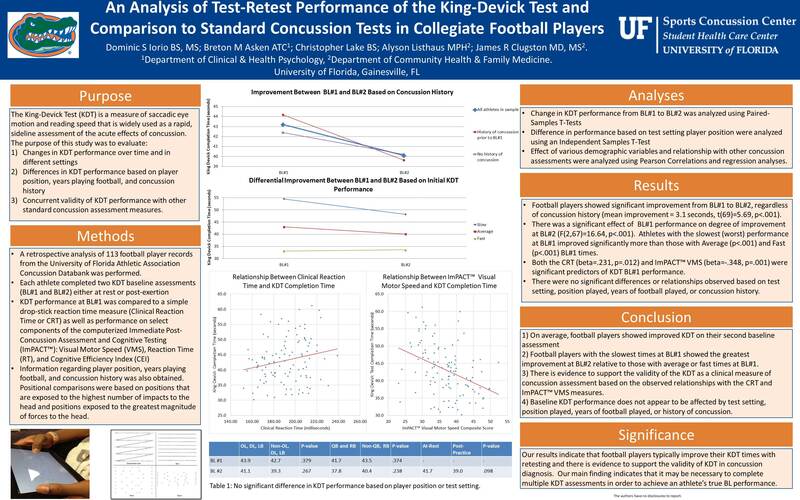 Lower Extremity Stiffness Changes following Concussion in Collegiate Football Players. DuBose, Dominique F.; Herman, Daniel C.; Jones, Debi L.; Tillman, Susan M.; Clugston, James R.; Pass, Anthony; Hernandez, Jorge A.; Vasilopoulos, Terrie; Horodyski, MaryBeth; and Chmielewski, Terese L. August 2016. Medicine & Science in Sports & Exercise. Concussion May Increase the Risk of Subsequent Lower Extremity Musculoskeletal Injury in Collegiate Athletes. Herman, D.; Jones, D.; Harrison, A.; Moser, M.; Tillman, S.; Farmer, K.; Pass, A.; Clugston, J.R.; Hernandez, J.; and Chmielewski, T.L. Sports Med (2016). DOI: 10.1007/s40279-016-0607-9. “Playing Through It”: Delayed Reporting and Removal From Athletic Activity After Concussion Predicts Prolonged Recovery. Asken, B.M. ; McCrea, M.A. ; Clugston, J.R.; Snyder, A.R. ; Houck, Z.M. ; and Bauer, R.M. 2016. Journal of Athletic Training. 51(5). 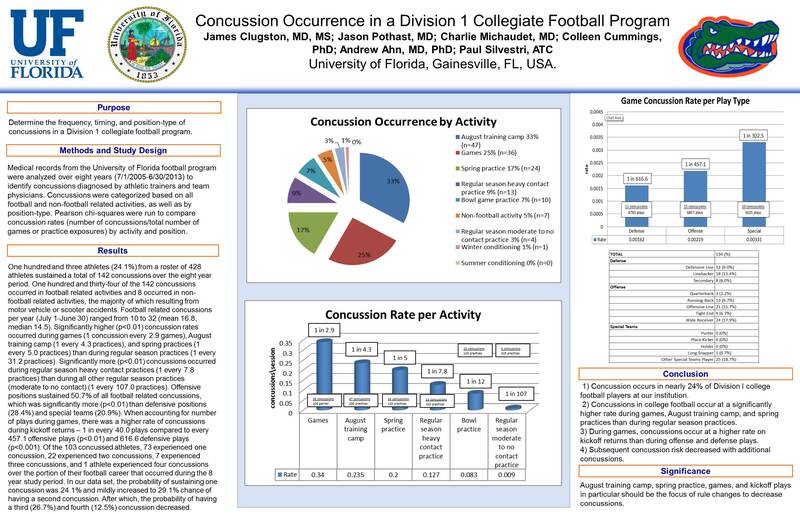 Epidemiology of Sport-Related Concussion in an NCAA Division I Football Bowl Subdivision Sample . Houck, Z.M. ; Asken, B.M. ; Bauer, R.M. ; Pothast, J.; Michaudet, C.; and Clugston J.R. 2016. The American Journal of Sports Medicine. Occipital Neuralgia as a Sequela of Sports Concussion: A Case Series and Review of the Literature. Zaremski J.L. ; Herman D.C.; Clugston J.R.; Hurley R.W. ; and Ahn A.H. 2015. Current Sports Medicine Reports. 14(1):16-19. Intracranial arteriovenous malformation in a collegiate football player and return to play considerations. Smith M.S. ; Friedman W.A. ; Smith K.B. ; Pass A.N. ; and Clugston J.R. 2014. Clinical Journal of Sports Medicine. 24(6): e62-64. Vision testing is additive to the sideline assessment of sports related concussion. Marinides, Z.; Galetta, K.M. ; Andrews, C.N. ; Wilson, J.A. ; Robinson, C.D. ; Herman, D.C.; Smith, M.S. ; Bentley, B.C. ; Galetta, S.L. ; Balcer, L.J. ; and Clugston, J.R. 2015. Neurology – Clinical Practice. 5(1):25-34. 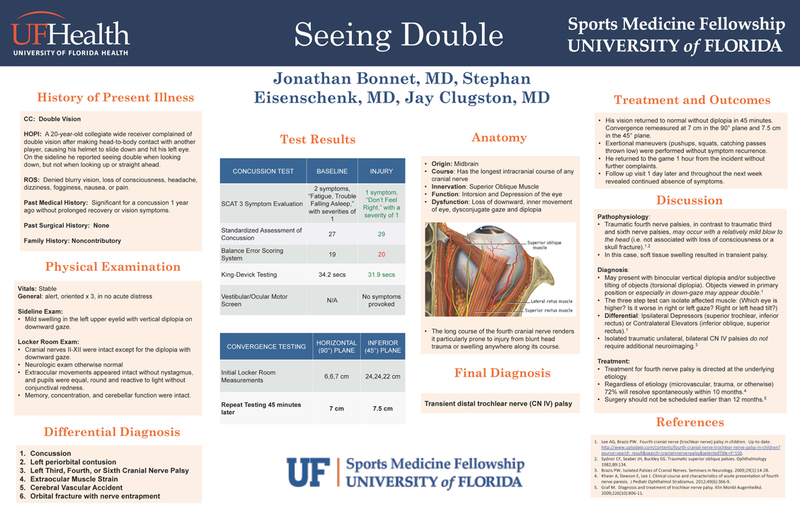 Seeing Double: Presented at the UF Community Health and Family Medicine Department’s Research Night, June 23, 2016, at the Champions Club in Ben Hill Griffin Stadium in Gainesville, Fla. 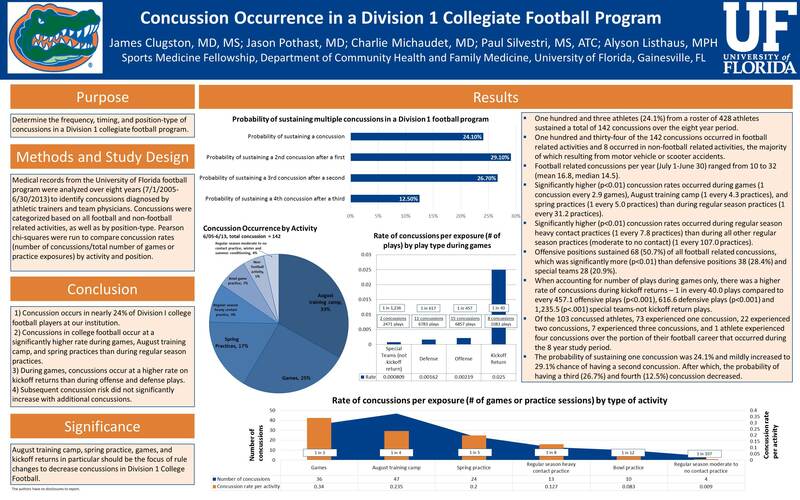 Epidemiology of Sport-Related Concussion in a NCAA Division 1 Football Bowl Subdivision Sample: Presented at the Sports Neuropsychology Society’s Concussion Symposium, April 29-30, 2016, at The Westin Houston in Houston, Texas. 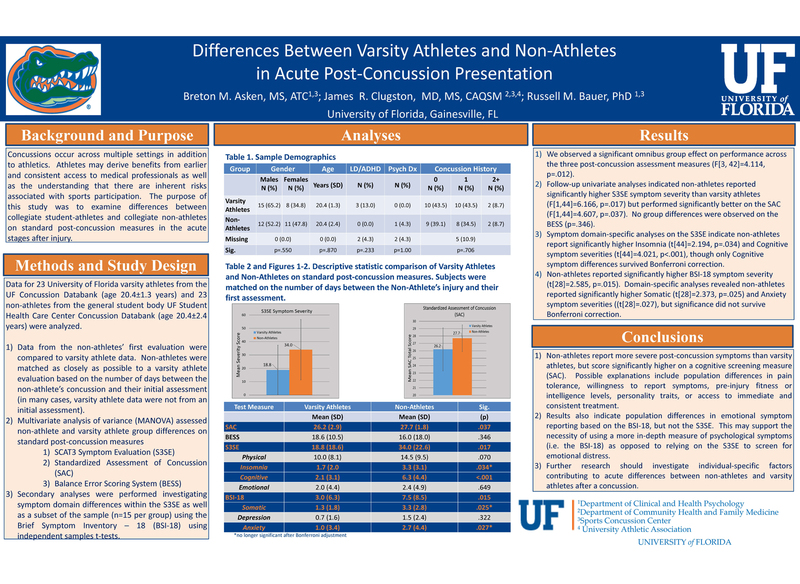 Differences Between Varsity Athletes and Non-Athletes in Acute Post-Concussion Presentation: Presented at the Sports Neuropsychology Society’s Concussion Symposium, April 29-30, 2016, at The Westin Houston in Houston, Texas. 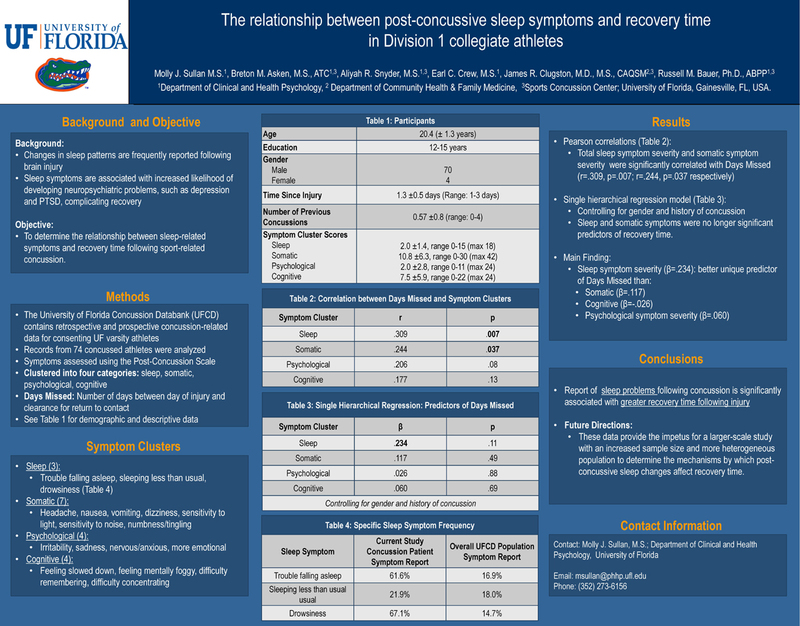 The Relationship Between Post-Concussive Sleep Symptoms and Recovery Time in Division 1 Collegiate Athletes: Presented at the International Neuropsychological Society 44th Annual Meeting, Feb. 3-6, 2016, at the Boston Marriott Copley Place in Boston, Mass. 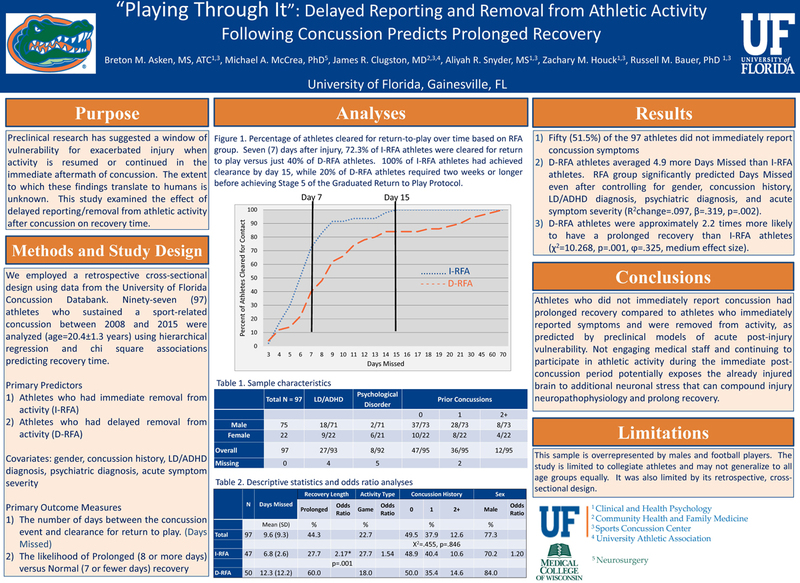 Playing Through It: Delayed Reporting and Removal from Athletic Activity Following Concussion Predicts Prolonged Recovery: Presented at the International Neuropsychological Society 44th Annual Meeting, Feb. 3-6, 2016, at the Boston Marriott Copley Place in Boston, Mass. 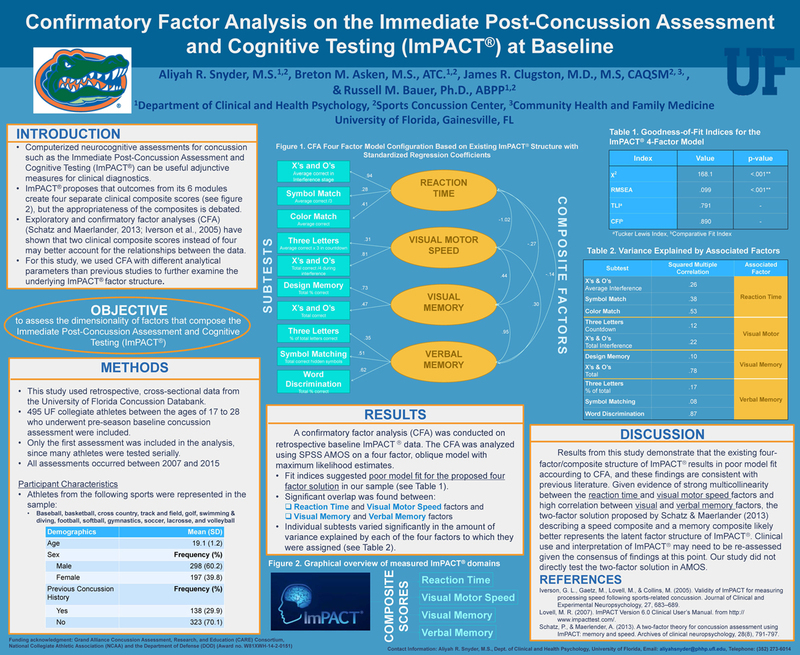 Confirmatory Factor Analysis on the Immediate Post-Concussion Assessment and Cognitive Testing (ImPACT): Presented at the International Neuropsychological Society 44th Annual Meeting, Feb. 3-6, 2016, at the Boston Marriott Copley Place in Boston, Mass. 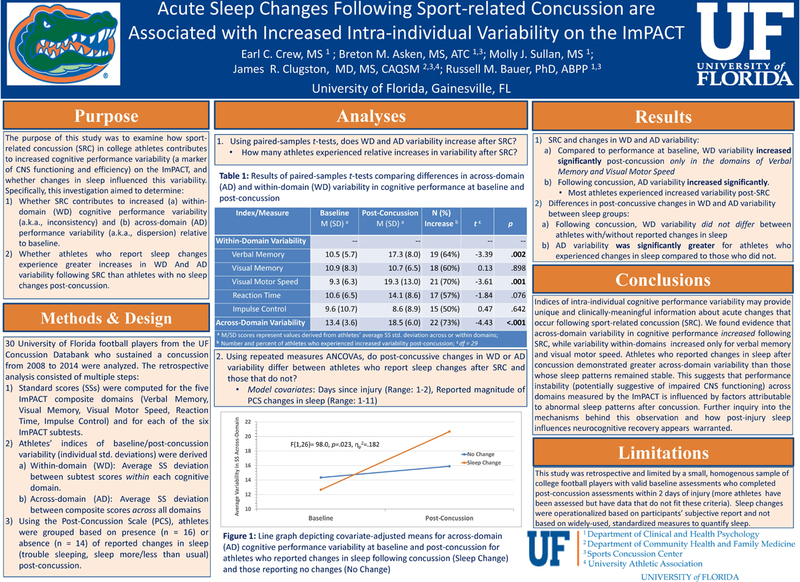 Acute Sleep Changes Following Sport-Related Concussion Are Associated with Intra-Individual Cognitive Variability on ImPACT: Presented at the International Neuropsychological Society 44th Annual Meeting, Feb. 3-6, 2016, at the Boston Marriott Copley Place in Boston, Mass. 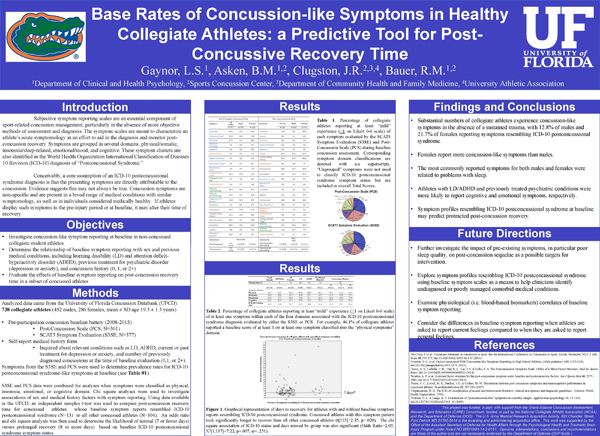 Base Rates of Concussion-Like Symptoms in Healthy Collegiate Athletes: A Predictive Tool for Post-Concussive Recovery Time: Presented at the International Neuropsychological Society 44th Annual Meeting, Feb. 3-6, 2016, at the Boston Marriott Copley Place in Boston, Mass. 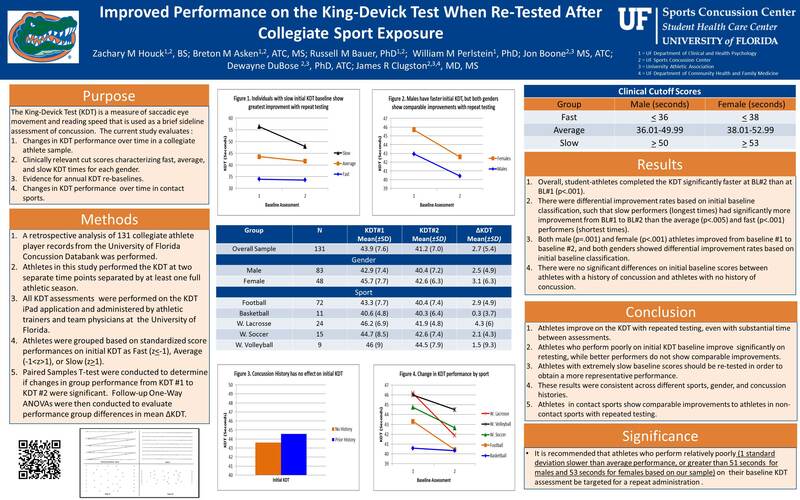 Improved Performance on the King-Devick Test When Re-Tested After Collegiate Sport Exposure: Presented at the Sports Neuropsychology Society’s Concussion Symposium, April 30 – May 2, 2015, at the Hyatt Regency Atlanta in Atlanta, Ga.
Baseline Test Performance and Days to Return-to-Contact – Implications for the Lack of Effectiveness of “Sandbagging” – BEST POSTER AWARD ACCOLADES: Presented at the Sports Neuropsychology Society’s Concussion Symposium, April 30 – May 2, 2015, at the Hyatt Regency Atlanta in Atlanta, Ga.
An Analysis of Baseline Clinical Reaction Time in Collegiate Football Players: Presented at the American Medical Society for Sports Medicine (AMSSM) Annual Meeting, April 14-19, 2015, at the Diplomat Resort & Spa in Hollywood, Fla.
An Analysis of Test-Retest Performance of the King-Devick Test and Comparison to Standard Concussion Tests in Collegiate Football Players: Presented at the University of Florida College of Medicine Research Day, February 2015, at the Stephen C. O’Connell Center in Gainesville, Fla.
Concussion Occurrence in a Division 1 Collegiate Football Program: Presented at the American Academy of Neurology (ANN) Sports Concussion Conference, July 11-13, 2014, at the Sheraton Chicago Hotels & Towers in Chicago, Ill.
Concussion Occurrence in a Division 1 Collegiate Football Program: Presented at the AMSSM Annual Meeting, April 5-9,2014, at the Hyatt Regency New Orleans in New Orleans, La.